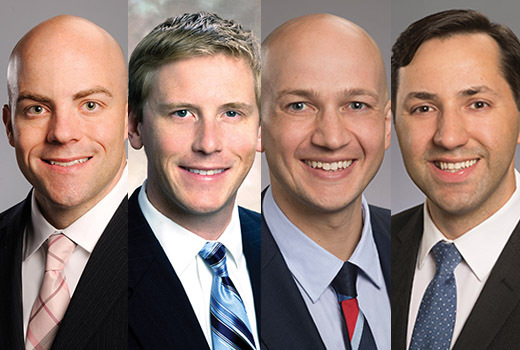 Smyrna clinic physicians include (left to right): Kyle Hammond, Jeffrey Webb, Lee Kneer, Mikhail Zhukalin. Emory Healthcare has opened a new outpatient clinic for orthopaedics, sports medicine, and spine treatment in Smyrna on South Cobb Drive. The location open on July 17, 2017 at 3903 S. Cobb Drive SE, Suite 275. The Smyrna clinic offers a full range of treatments and physical therapy services for orthopaedic and sports conditions, including injuries resulting in sprains, fractures, dislocations and tears, as well as spine conditions resulting in neck, shoulder or back pain. It also includes an on-site MRI for imaging services. The location is housed in an 8,000 square-foot space at the Emory Clinic on the Emory at Smyrna campus, which currently offers a full range of primary care services. It opens with four physicians utilizing 12 exam rooms and one to two physical therapists in the onsite physical therapy clinic. Future plans are in place to build an even larger operation in a new medical office space on the campus and in renovated space at Emory at Smyrna for orthopaedics and other specialties. Emory Healthcare targeted Smyrna—just outside the Atlanta Perimeter—in an effort to meet the increasing demands for orthopaedic care in the booming Smyrna area and create ease of access to Emory's Services. In March, Emory Healthcare announced a new partnership with the Atlanta Braves as the team's official healthcare provider. Emory sports medicine, orthopaedics and spine physicians at the Smyrna clinic will provide comprehensive care to Atlanta Braves team members. "The opening of our Smyrna regional office for Emory Orthopaedics & Spine Center is part of a broader strategic initiative, says Scott D. Boden, MD, director, Orthopaedic Business Development and Strategy for Emory Healthcare. "Our goal is to provide Atlanta residents with closer access to this highly talented group of surgeons and non-surgical physicians." Boden is also chief medical officer and chief quality officer of the Emory University Orthopaedics & Spine Hospital, which focuses predominantly on joint replacement and spine surgery and produces the highest patient satisfaction ratings of hospitals in Georgia. The Smyrna clinic is the latest Emory orthopaedic clinic to open in the Atlanta metropolitan area to serve local populations. Emory Orthopaedics & Spine Center has locations in Brookhaven, Dunwoody, Johns Creek, Tucker and Sugarloaf. In addition, Emory University Orthopaedics & Spine Hospital in Tucker is Georgia's only hospital dedicated specifically to orthopaedic and spine treatment. Emory Healthcare operates multiple outpatient clinic locations across the metropolitan area from primary care and urgent care locations to clinics offering many of Emory's 73 specialty services.